In the latest sign that the movie “Idiocracy” was a work of prophetic genius, the big-brains behind Facebook are testing out new [Satire] tags, so that unsuspecting ideologues the world over will stop sharing fake news articles as the real thing. Because we’re all too stupid to know the difference and because we obviously care less that Facebook is sucking out our brains. Currently in a very limited testing stage, the tags appear only in the “Related Articles” section and only after a user has clicked on a satire article. When the user comes back to the page, the tag prefaces the titles of a similar nature. So it’s subtle in a “here’s some hindsight for you, dummy” kind of way. According to Facebook, they have gotten feedback from users that sites like The Onion, Clickhole and The Daily Currant often post fake news articles and videos that will then become liked, comment on and shared. So Step One: Recognizing the problem. 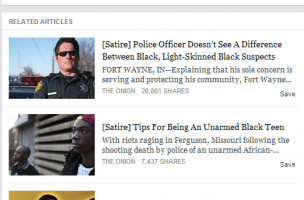 Not one to be afraid of a little controversy, The Onion took to the internet with their reaction to the news in an article entitled, “Area Facebook User Incredibly Stupid.” The article doesn’t specifically address the [satire] tag issue, but refers to a user who often gets confused and angry while using Facebook and that it should be fixed. A Washington Post article on the tag issue pointed to the proliferation of fake sites (both the satirical variety and those fully intended to hoax a gullible public) are making it difficult to filter out the satire from real news stories. But are the satirical sites REALLY the problem here? Reporter Caitlin Dewey writes, “Organizations such as Canada’s Media Smarts have proposed another: better media literacy education, to ensure people have the critical thinking skills to understand, and question, what they read online.” Sage advice there. Dewey’s contention though, is that Facebook’s move is one that takes a stand against the rising tide of faux journalism. But I would argue, it’s just another way Facebook is slowly sucking out your brain. Have we become so lax in critical thinking – so lazy that even taking the time to question things and seek out alternative sources of information is SO impossible? Or is it that we have been trained to believe that if something is posted to the internet, then by golly it must be THE TRUTH. Has the joke become the reality? As Fox Mulder was so fond of saying on The X-Files – the truth is out there. So exercise that cerebral cortex (the area of the brain responsible for critical thinking . . . ) and learn to recognize when someone is pulling your leg. Don’t let Facebook do it for you.